Merchant, MLA (1914-1915), MLA (1916-1920), MLA (1921-1922), MLA (1923-1927). Born at St. Vital on 22 February 1873, son of Firmin Hamelin and Clemence Breland, grandson of Salomon Hamelin and of Pascal Breland, he was raised on a cattle ranch and later educated at St. Boniface College and Juniorate of the Sacred Heart (Ottawa). In 1898, he opened a general store at Ste. Rose du Lac under the name of Joseph Hamelin Company. On 12 February 1900, he married Parmelie Gamache, daughter of Pierre Gamache, of St. Georges d'Henriville, Quebec. They had six boys and four girls. He was elected Reeve of the Rural Municipality of Ste. Rose in 1910 and served as such for six years. He was first elected to the Manitoba Legislature at the 1914 general election. 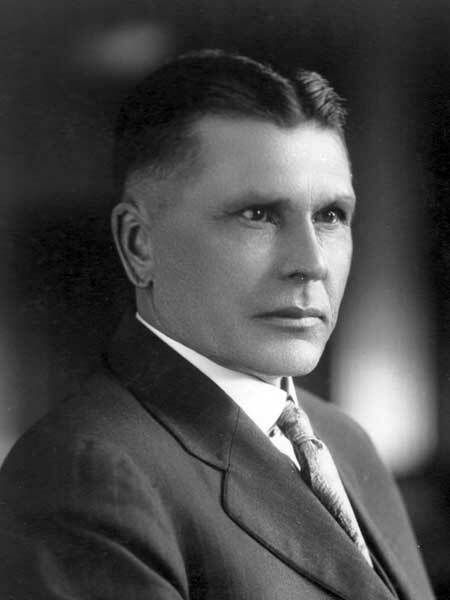 Following the downfall of the Conservative government of Rodmond Roblin, he was one of a handful of Conservatives returned to power in 1915, 1920, and 1922. He was defeated in 1927 and 1936. He died at Niagara Falls, Ontario on 29 August 1947. His body was returned to Manitoba for burial in the Fort Garry Cemetery. “Joseph Hamelin, former M.L.A., dies in Ontario,” Winnipeg Free Press, 3 September 1947, page 19. We thank Robert Clark for providing additional information used here.